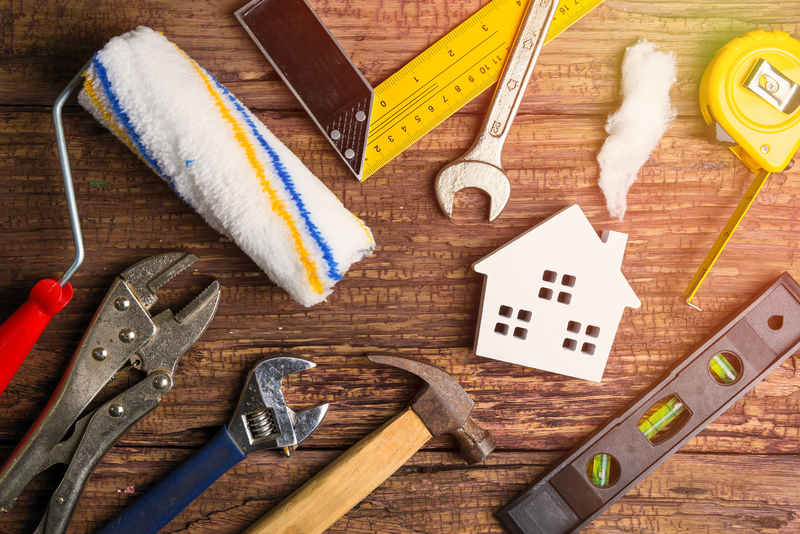 From concept to reality - We do it all and offer a free Quotation ( Not Estimate ) advice and guidance - coupled with our Price Guarantee on all jobs. Here you have found a one stop shop for all types of project. Join us as a Client and you will stay with us as a Friend. 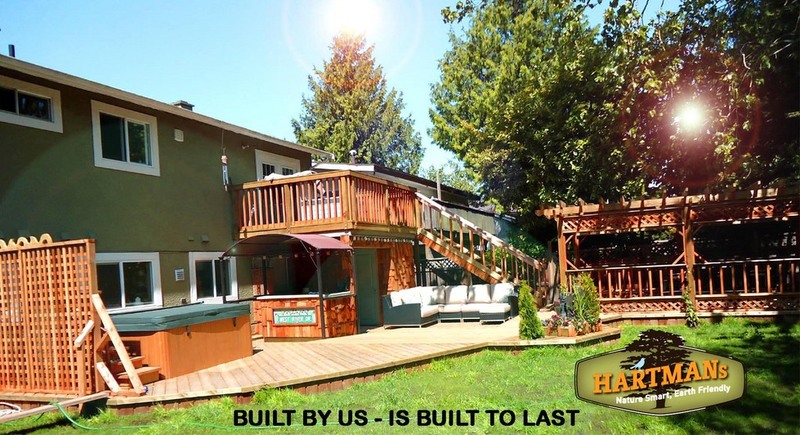 When it comes to the design, renewal or retro fit of your garden deck and entertaining areas, you will find the Hartman's team is exactly what you've been looking for. We handle every aspect of your new deck and can include, selective lighting, water features, endless choices of styles and finishes, color coordination and green treatment protection, pergolas, gazebos and much more, all designed to give you the most cost effective bang for your buck. We can also provide full yard landscaping and hardscape to fully enhance your overall outdoor environment and experience. 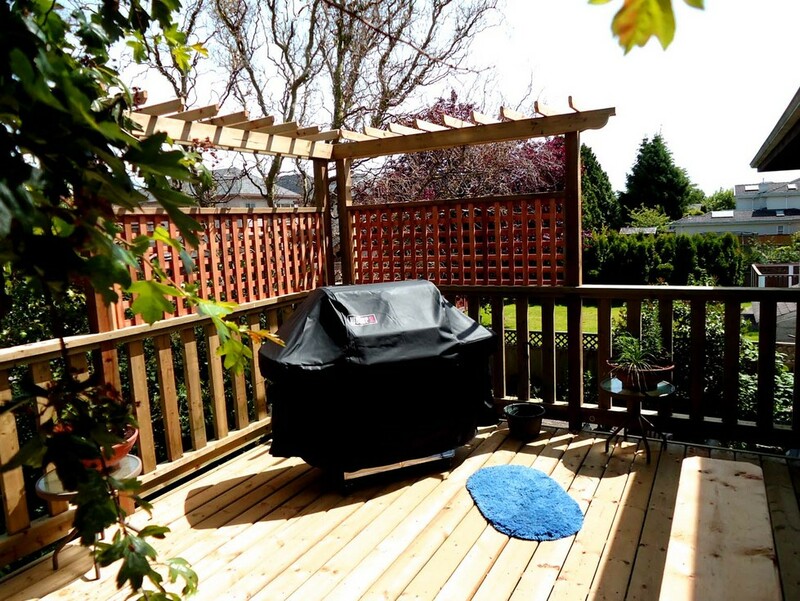 These pictures are from recent decking projects we have done and provide you with some examples of split levels, storage sheds, pergola eating areas, in-built hot tubs and bars and so on. Your own imagination and of course your budget are the only limiting factors on just how far you can go with your outdoor living area. 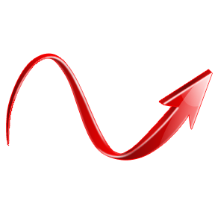 We will work closely with you right from the concept and all the way through to reality. You will have a structurally sound deck that will be guaranteed to last for many years more than most others. On the left is the start of a double entertainment deck that required to allow access between them to the basement suite. The client wanted to connect both decks while still leaving access to the suite and on the right you can see the structural bridge that allows for this. When completed, all areas will be automatically illuminated by low voltage 25 year LED selective lighting. There will also be a small feature pergola above the sliding doors, an on deck gas fire pit and BBQ and coordinated stain and paint for both the decks and the house. 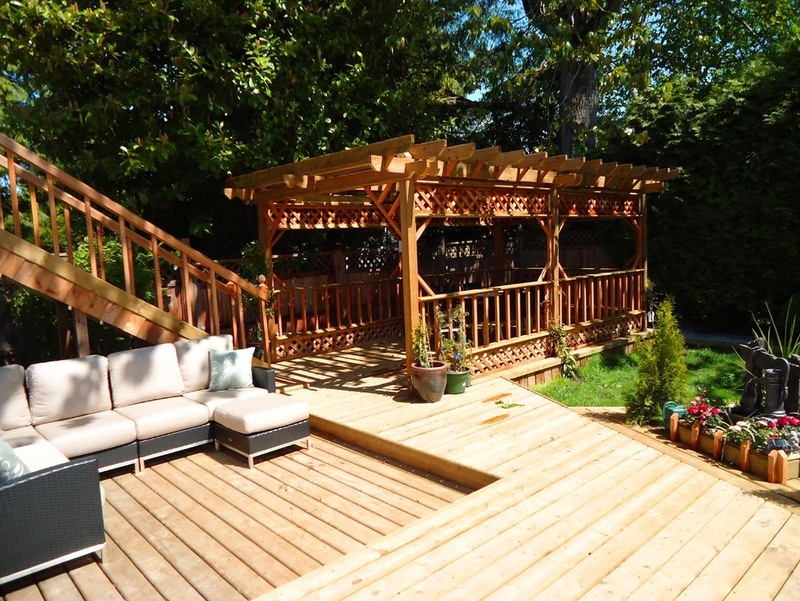 More pictures will follow upon completion of this deck and yard project located in Surrey. This large double deck with an engineered bridge across to give access to the basement suite, was constructed in North Surrey for Maria & Carlos. From one deck we also blew through the exterior wall of their home to create a French door access on to a natural stone step and deck, and the second deck has an extremely high output gas fire pit permanently installed. 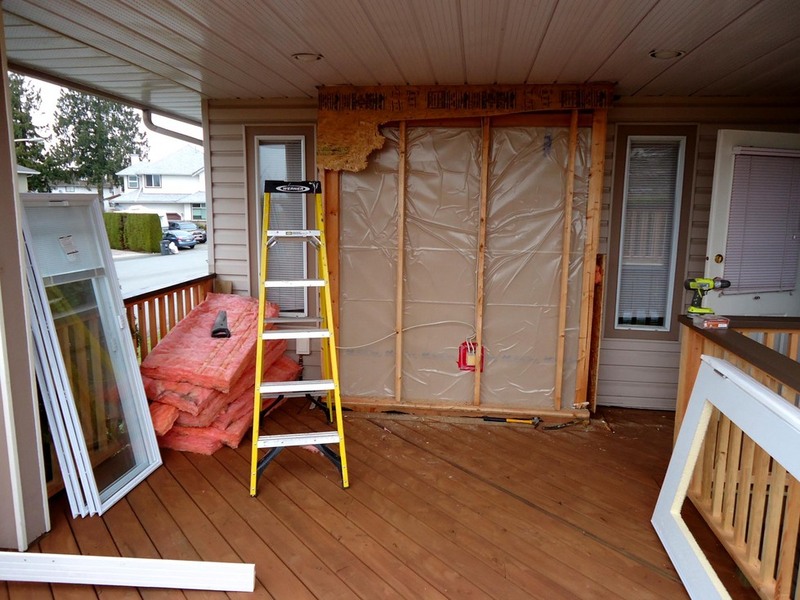 These pictures to the right show where the wall was blown out, the outward breast removed and the new French doors installed. All existing window trims were re-painted to match the new deck rails and you can see how much better this visual difference in color scheme improves the house in general. At the same time as the above decks were being constructed, the front driveway of the same property was also extended by us using four inch thick Grade 1 concrete pavers in 'Shadow' color. This area was designed for very heavy vehicular traffic parking and has some very supportive and densely compacted road base with compacted sea shell sand underneath. In this photograph, finished edging for soil retention has still to be installed and the whole work area cleaned and washed. 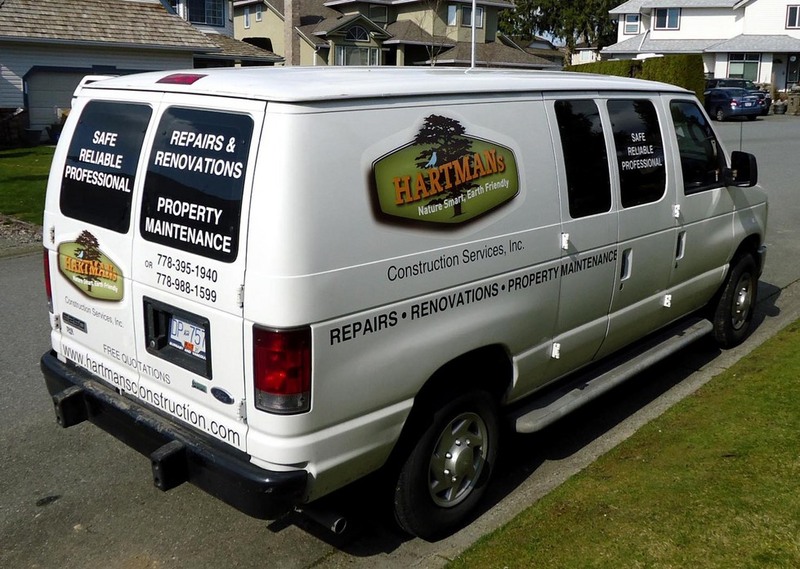 When you have one of these vans parked outside your home, you will always know you are in good hands and that your project will be handled in the most cost effective way and always completed to the highest standards of quality. New well designed decks and paved driveways are known to add great value and curb appeal to your home ... so why not call us today and obtain your FREE QUOTATION and advice from qualified people you can trust and depend upon. Decks and all other outdoor lumber that is treated with our unique and all natural Perma Shield product, will be guaranteed against all types of rot, decay, fungal attack, mildew, insect attack and damage by moisture or water for a minimum period of 15 years. 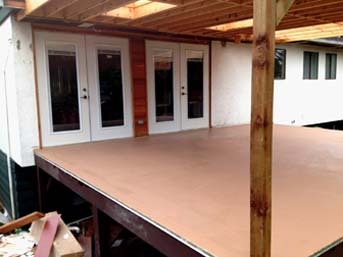 We can also provide waterproof coverings for decks such as fiberglass or vinyl. Every deck we build is truly unique in both design & feature and every one of them is constructed to last indefinitely. You can choose your deck surfaces in natural treated timber, Trex or other composites, or timber covered in permanent Fiberglass or other special coatings and the posts and rails can be finished in natural look, micro porous stained, painted or colored. glazed panels or spindles. We are the BC Award Winners for Decks. We also have our own unique all natural timber treatment as an option that will fully protect your deck timbers for more than thirty years. 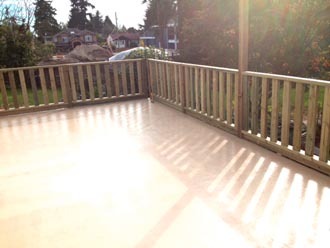 This spacious deck is covered in fiber glass and then carefully treated and hand painted to create the ambiance our customers wanted. It is fully illuminated with almost 2000 computerized LED lights around the rails and stairs. A truly unique deck and entertainment area in general. The structural roof is designed to give shelter and shade while one end of is has been left open as a pergola area for the bar and to allow BBQ smoke to escape easier. Double French doors were installed giving open access from the house and the whole deck area has been themed in Tiki style as requested by our clients. All of the timber handrails have been hand notched and burned to compliment the Tiki theme and these have also been permanently sealed in clear fiber glass resins, making them totally impervious to water, rot and decay. 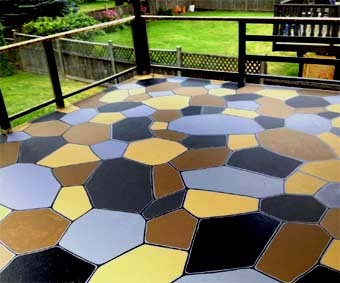 We can provide painted deck surfaces in any design of your choice, including pictures, scenes, themes or whatever. Now you are only limited by your own imagination and what ever your choice may be ... we will build it to enjoy and last. 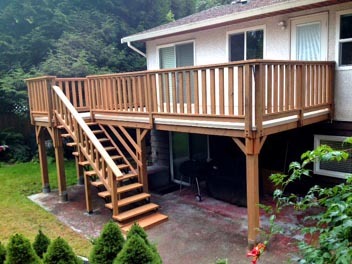 A waterproof under deck with a composite Trex top deck complete with new face mounted bronze finish glass rails. 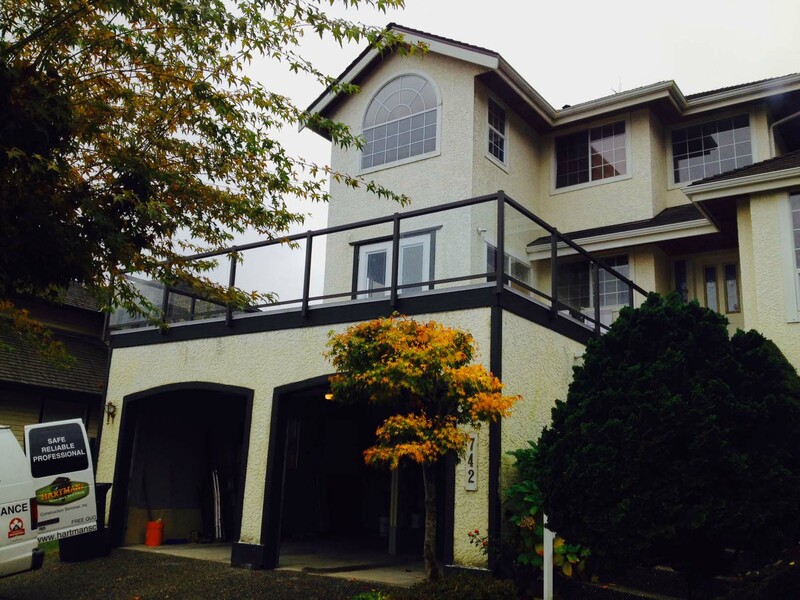 The deck below is in Coquitlam and was designed to include a hidden rain water removal system, thus alleviating the previous edge mounted gutters all around the fascia of the garage.